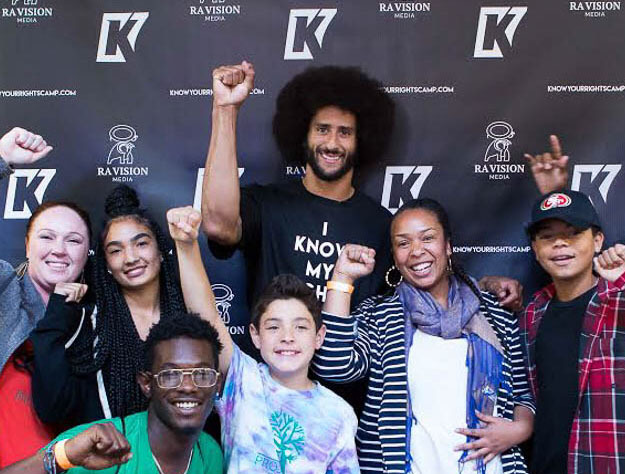 Quarterback Colin Kaepernick engaged and redirected the consciousness of sports when he knelt at the 49ers’ final 2016 game during the U.S. national anthem rather than sit as he had done previously. In protesting the nationwide series of unpunished police killings and harassment of people of color, he was insisting that the nation acknowledge how far from justice we are. Since a year ago, he has scored his greatest touchdown off the field and within the hearts of communities throughout the nation and around the world by casting a light on the conversation that America needs to have. But his actions have cost him his career. Because of Mr. Kaepernick’s immense courage in holding up the banner of truth to American big business and big politics, his actions in taking a stand in one of the most hostile of environments, his philanthropy at the grassroots level, his inspiration to all races and his determination to follow in the traditions of the greatest athletes of our recent past–football All-American Paul Robeson facing down the House Un-American Activities Committee; runners Tommy Smith and John Carlos protesting racial injustice with black-gloved fists raised and heads bowed at the 1968 Olympics and Muhammad Ali sacrificing his heavyweight champion title by being a conscientious objector to the Vietnam War — Colin Kaepernick is Our Time Press’ 2017 Man of the Year. Next articleHypocrites Trump & Moore Cannot Make America Great Again!